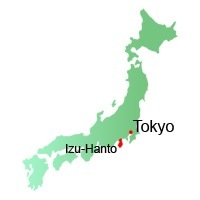 The Izu peninsula is situated south of the Hakone National Park, and south west of Tokyo. The east side of the peninsula is rather easily reached by train, but the west side has no train service, and buses will need to be used. Since the Japan Rail Pass does not cover most of the peninsula traveling through West-Izu can be quite expensive. 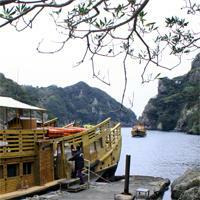 A nice boat trip can be made from Shimoda (the last train stop) to Iro-zaki, the farthest point on the pensinsula. From Tokyo it is an easy ride by Tokaido shinkansen to Atami or Ito (about 1 hour). Both of these cities are known for their hotsprings, and are popular with the Tokyoites. This popularity also means that these cities have lost much of their original charm. Once past Ito, the number of tourists decreases, and the island gets prettier. We reached the Izu peninsula throught Izu afer visiting Hakone National Park. After Ito, the JR rail passes are not valid anymore. 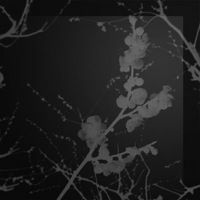 Therefore, a trip through the Izu Peninsula can become quite expensive. Still, the peninsula is extremely beautiful when the weather is nice. Also, since there aren't a lot of tourist, maps are often only in Japanese. Our trip through the peninsula was the only time in Japan that we couldn't find timetables in English. 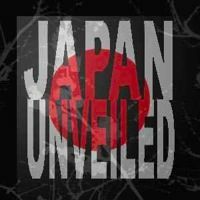 We had to use Japanese ones. We stayed at Ito, because it was late. Ito has a nice beach, where local fishermen crawl the beaches, searching for shrimp in the sand tide pools. Cheap hotels in Ito are business hotels. We stayed at a hotel on the beach, for some 5000 yen a night. Next morning we left as early as we could to take the 6h00 train to Shimoda. The train track follows the contours of the east side of the peninsula. It runs along cliffs and beaches, and offers marvelous views. After about an hour, we arrived in a still sleepy Shimoda. Although Shimoda is a nice city to stay in for a day or two and visit one of the onsen, we opted to go to the harbor and take a boat trip to the tip of the Izu-hanto, Irozaki. 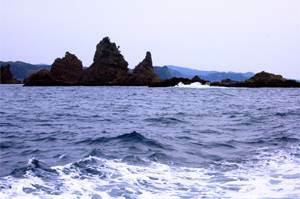 Floating along the coastline, gave us some truly wonderful views on the high cliffs and the rocks in the sea (Minokake Iwa). At the end of the trip, which takes some 45 minutes (and around 1500 yen), you move in between two mountains that rise up out of the ocean, to arrive at the small harbor of Irozaki. 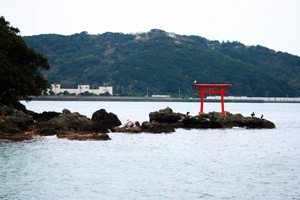 Even though Iro-zaki is at the far end of the peninsula and only reachable by bus or boat (or car of course), the harbor still has many tourist trapping shops. In springtime though this is a quiet and beautiful place to be. There is nothing much to do at the harbor itself, and one might be tempted to leave straight away. Don't. Turn to the left, and up the mountains. Then you will not miss a nice hike to the panoramic viewpoint, and the lighthouse. 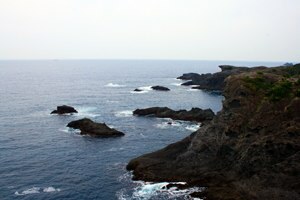 We continued our trip around Izu-hanto by taking the bus to Dogashima. 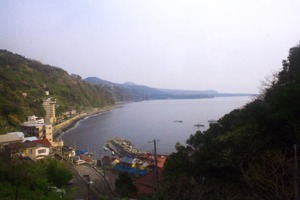 This is a very beautiful bus trip, through small villages and along the west shore of Izu. 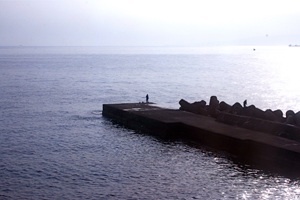 The west coast of Izu is not a big tourist draw, mainly because of the absence of trains, but it had splendid views on the ocean, and very nice onsen. 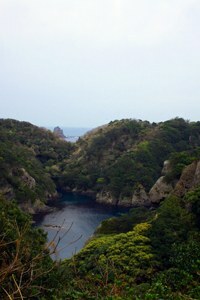 Dogashima is one of the coastal towns that offer short boat trips to get a sea-side view of the peninsula. 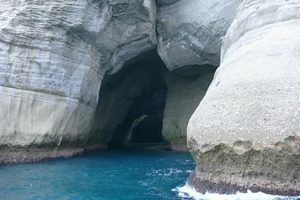 Dogashima is known for providing a boat trip that enters one of the caves carved out the rocks by the sea. However, when we were there, the caves were closed because of instability in the rocks. We went to Heda afterwards, which was described as a small fisherman town. It was a bit of a disappointment to us, as it was completely deserted with little more to do than watch the fishermen. Because at the tourist office they spoke only Japanese (can't blame them, because of the few non-Japanese tourists) we did not know what else to do, and we left. It was already rather late, but we could still take a bus to Shuzenji, the train to Mishima, and take a shinkansen to Nara.